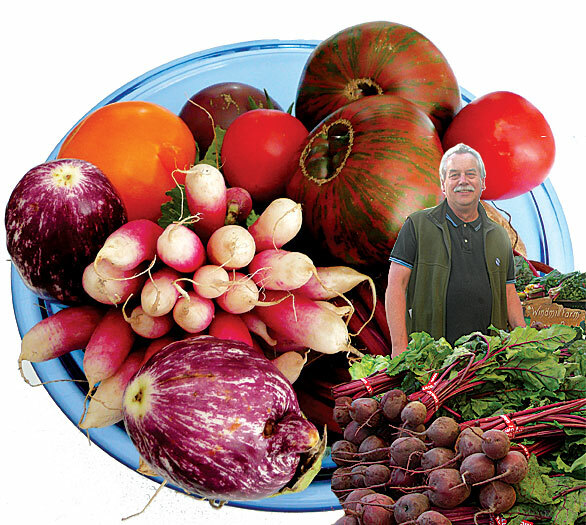 Tim Fitzmaurice enjoys the Downtown Santa Cruz Farmers Market. Photo: Debbie Bulger. Produce photo: Vivienne Orgel. Shopping at Certified Farmers Markets is a great way to buy fresh and organic fruits and vegetables and also supports small-scale family farmers. These farmers are leading the way to building a new food system which supports the environment. Many family farmers utilize sustainable practices such as planting hedge rows which provide areas of natural habitat, growing a diversity of crops which helps prevent plant disease, planting flowers to attract beneficial insects, and using compost and cover crops to enrich the soil. Such activities result in delicious produce and are big steps to conserving land. A Certified Farmers Market means that the farmers sell only what they grow themselves. If a farm stall is "certified" it has a certificate (that you can see if you want) from the government listing what the farmer grows. Many farmers markets have requirements that vendors farm within a specified geographic distance. Many farmers sell Certified Organic fruits and vegetables. Organic farmers grow food based on a system of farming that maintains and replenishes soil fertility without the use of toxic and persistent pesticides and fertilizers. "Certified organic" means an accredited agency has confirmed that the farmer meets stringent organic requirements. Shopping at local farmers markets can reduce your carbon footprint since you are purchasing food that is grown locally instead of being shipped halfway around the world. The first farmers market in California was started by the Interfaith Hunger Coalition. In 1978, the California Certified Farmers Market Association created standards and a support system for farmers markets, helping farmers sell their crops directly to the public. This direct connection between farmers and customers gives the customer the ability to know the people who grow their food. Sundays: 10:00 a.m. to 2:00 p.m.
Sundays: 11:30 a.m. - 5:30 p.m.
Mondays: 4:00 - 7:00 p.m.
Thursdays: 9:00 a.m. - 4:00 p.m.
Sundays: 11:00 a.m. - 2:00 p.m.
Wednesdays: 1:30 p.m. - 6:30 p.m.
Tuesdays: 2:30 - 6:30 p.m.
Saturdays: 2:30 - 6:30 p.m.
Tuesday and Friday, noon - 6:00 p.m.
Fridays: 3:00 - 7:00 p.m.